It’s been something of an Angel themed week and to finish it off before the publication of ‘Angel’ on 1st October, here is my review. I was given a finished copy of ‘Angel’ from Usborne to review on here. As I work in a bookstore, I have also arranged a book signing event with Lee Weatherly on 29th October which I’m very excited about. I’m always a bit sceptical about teen reads which continue an ongoing trend. To this day I have not read the Twilight books. I think it grates on my friend’s nerves that I haven’t been open to it, and I probably should be. So when given ‘Angel’ I was worried I wouldn’t be open in my opinion of that book…I needn’t have worried, it’s fantastic, it’s original and I will be pestering Usborne for a review copy of the sequel as soon as it comes in. Willow Fields doesn’t fit in with the usual teen crowd at school. She fixes cars and actually enjoys doing it, much to her friend Nina’s embarassment and she has another unusual talent…she’s psychic. Willow has never really given this much thought until she does a reading for someone that will change her and everyone’s lives forever. There is an unseen growing threat in the world; angels. These seemingly beautiful, serene creatures are here on earth for selfish reasons and their powers are literally draining the life out of everyone who looks at them. Willow seems to be the only one who can see this danger as everyone else is affected by the mind controlling ‘angel-burn’. That is until she meets angel killer Alex. He is trained to see angels for what they are; evil. So why is he after Willow? Willow and Alex, forced into relying on each other for the sake of their lives, soon learn that the saying ‘live together or die alone’ is very much in play and they soon find themselves falling in love against their own better judgement and they embark on a dangerous journey to save humankind. Angel is quite simply thrilling. It has everything you could possibly want or need from a young adult/teen read. The intense drama builds quietly through the first few chapters and soon you are catapulted into a world that was once so safe and is now in danger of being overrun by Angels. The concept that angels could be evil was difficult to overcome at first but this made the actions of all the ‘angel-burned’ humans all the more justified and real. Willow herself is catapulted from bedroom psychic readings to being shot at on a daily basis. Her yearnings for her mother, and for the sanctuary of home make an otherwise unique, disarming character relatable and ironically; more human. For so much to happen in only the first book, I can’t begin to imagine where the sequel will lead us but I can tell you this; I am well and truly hooked and Angel is a book I will recommend to anyone who will listen, but with the added reminder that “the only good angel is a dead angel”! This book is going to be huge, and one that will stick around for a while…angels aren’t that easy to get rid off! 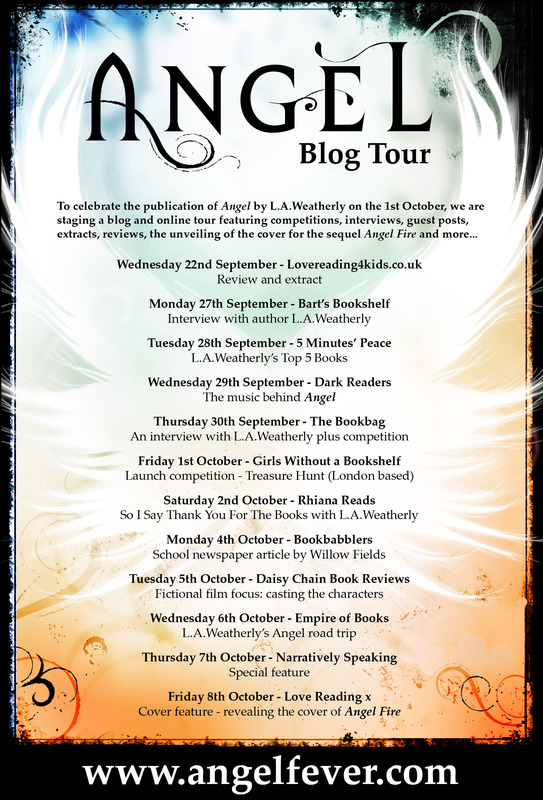 The Angel blog tour is happening throughout September and October to promote the release of Angel the first of three books by L.A Weatherly. 1. Gone With the Wind, Margaret Mitchell. Very dated in some of its attitudes, but nothing beats it for sheer storytelling. 2. The Rama series, Arthur C. Clarke and Gentry Lee. And I’m not even a science fiction fan. But just read them, they’re amazing. 3. 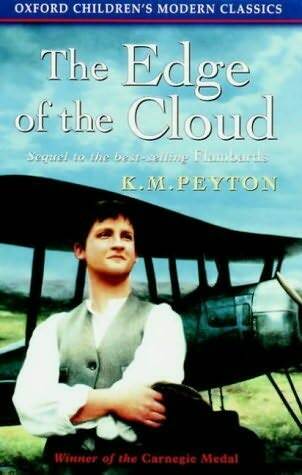 The Edge of the Cloud, K. M. Peyton. I love all the Flambards books, but particularly this one, which focuses on the romance between Christina and Will. I fell completely in love with Will as a teenager. 4. 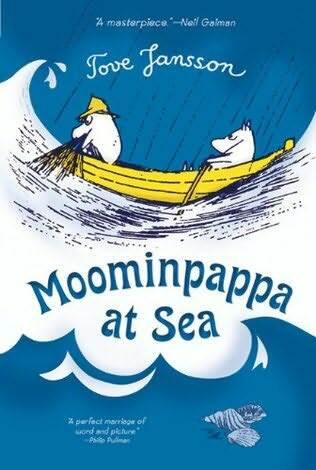 Moominpappa at Sea, Tove Jansson. My favourite of the Moomin books (which I’m a huge fan of!). Dark and brooding. 5. The Silver Chair, C. S. Lewis. I reread the Narnia books every few years or so. This one is a particular favourite; I love the journey with Puddleglum, and the captive prince in the world without sunlight. What a diverse list of books indeed, thanks Lee! I thought it would be interesting to compare these five books against Angel as I can certainly see where a few inspirations come from. Angel is a fast-paced thriller certainly but is a hybrid of romance and sci-fi…it’s got everything you could possibly want from a book. 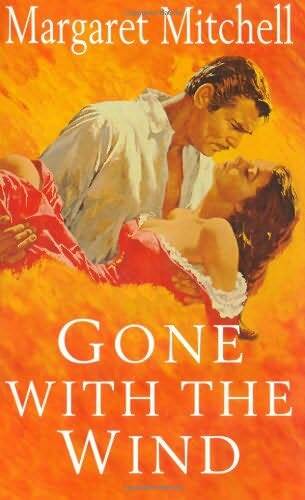 Gone With the Wind is a beautiful story, beautifully told. Like Scarlett O’Hara, Willow Shields in Angel is a lonely, captivating figure…one of intrigue to other men. I’ve not read any sci-fi if I’m entirely honest. It lurks away in the recesses of bookshop walls but certainly with an story such as Angel, it’s important to explore all elements of the sci-fi genre. Lee talks of her teen crush Will from Edge of the Cloud. Similarly I find myself drawn to Alex in Angel. His heroic nature is admirable yet he’s also very disarming in his growing concern for Willow which to me makes him so much more attractive. Any fan of The Moomin’s is top notch in my books. We all need a little fun and escapism in life and it becomes quite clear that Jansson provides this…for a lot of unsuspecting people. And finally, a Narnia tale, The Silver Chair. I love the tales by C.S. Lewis and whilst I don’t remember this tale so well from my childhood I do remember that feeling of possibility. When Aslan comes back to life, anything is possible and we see this in Angel as the angels take path in a book that is sure to open up the market for books about Angel. It’s been a lot of fun participating in this blog tour, and I hope Lee has had fun being grilled by everyone. Please check back here tomorrow morning for my review of Angel. The ‘Angel’ Blog Tour is coming! I’m sure you have all seen me singing the praises of ‘Angel’ by L.A. Weatherly on twitter, a new book published October 2010 by Usborne. Part of a stunning trilogy this book is not about vampires, nor werewolves…now it’s all about Angels! It’s an absolutely amazing book, I can’t wait to spread the word and after my long train journey today in which I will finally finish Angel, I’ll be posting my review. Just in time for my participation in the Angel blog tour. On the poster below, you can see all participating blogs as L.A. Weatherly lets us in to the world of Alex and Willow. Next Wednesday L.A. Weatherly will be telling me her top five favourite teen reads that inspire her. I’ve just been sent this stunning book and I had to tell you all about it immediately. I’d put this down on your Christmas list…whether it’s a gift for the children or just a gift for yourself. I’ll certainly be displaying it on a feature space at work as Christmas draws nearer. It also featured in last weeks The Bookseller magazine for the children’s Christmas bestseller category preview. 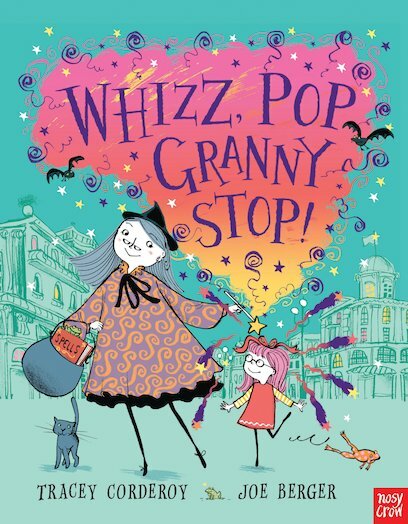 It’s slightly longer than a normal picture book and I’d certainly class it as a gift book and the message it evokes is clearly to be understood for an older audience of 5+. It is just a stunning book and the attention to detail leaves you breathless as the harsh landscape is juxtaposed with a warming story of man learning to live with nature again, rather than destroy it. I really don’t want to give much away as this story is as much about discovery throughout, as it is enjoying the vast imagery and kind story. I finished this story comforted, reminded that a little bit of magic does still exist and we should do everything we can to protect it, and live in harmony. Whilst children may not come away with such a strong opinion, it is a book which will affect them and draw them in to the Arctic landscape, as they momentarily forget where they are; curled up by the fire at Christmas. I got sent this from Walker books and just had to share it with you because it’s just so fun! I admit, this book digresses from my normal taste in picture books but that’s not to say it’s worth any less of your attention. 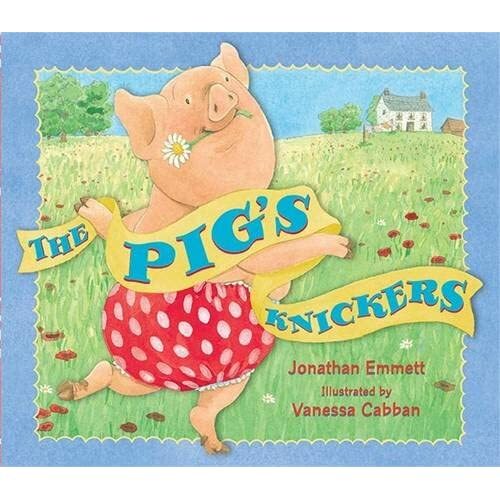 Written by Jonathan Emmett, illustrated by Vanessa Cabban, ‘The Pig’s Knickers’ harks back to the older traditions of picture books. 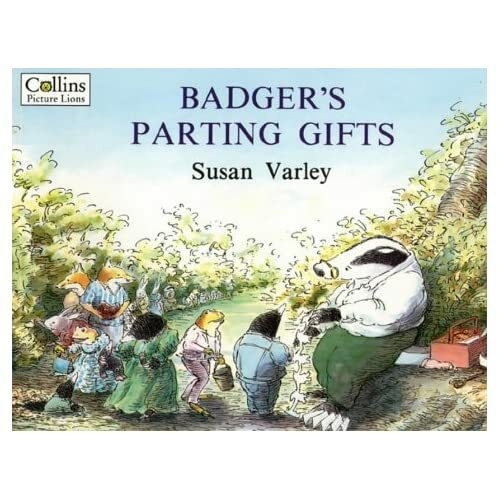 In hardback form, and based on a farm the illustrations are fun and give us a sense of the true countryside. There’s the big trees, many many fields, lots of animals…oh and a giant pair of knickers! Pig (who is male I might add) feels rather drab as a plain old pig until one blustery day, a pair of giant polka dot knickers blow from the washing line, right into Pig’s trough. Bored as he is, Pig just has to try them on and finds himself rather fetching in them. 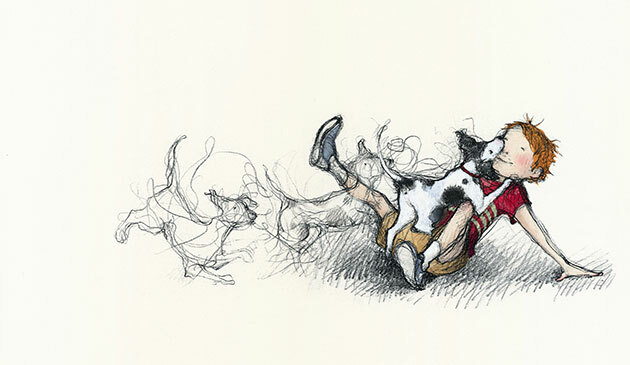 It gives him confidence to show off to this friends…that is until a pesky goat ruins his fun. But in the end Pig’s friends teach him that it is he who is fun and fetching, and the polka-dot knickers were just a lovely accessory. What a delightfully silly, ridiculous story that will keep you giggling incrediously for a few hours. And my belief is, if the Aliens who love underpants can get away with something so silly, then so can Pig! Published by David Fickling Books, ‘Trash’ is a dystopian fiction book that welcomes us into the somewhat unwashed arms of Raphael, who lives his life as a dumpsite boy with his two friends Gardo and Rat. Told by Raphael himself but with interchanging narrators throughout, we learn that he and his friends don’t have a lot going for them, other than their friendship. But one day, that all changes when they stumble across a bag and this bag fundamentally changes their lives forever and brings about the unexpected. It had to happen eventually…all that trash and not one thing of worth to be found? Surely not! But in the end, is this leather bag that Raphael has found worth it? Once the police and an old foe start to track them down, Raphael begins to wish life could go back to normal and he could just be sorting through rubbish, invisible to the world. For me, it’s the fact that the children are suddently noticed because they had something of worth that resounded with me the most. The plight of these three children, and indeed children around the world is horrific and they are taken advantage of. It is refreshing to find a book so solely focused on the survival of the underdog. Whilst Raphael, Gardo and Rat are uneducated, smelly dumpsite workers- they have a lot more going for them than others; friendship, perseverence and courage. This isn’t a comfortable book, in the sense that it doesn’t hide behind its fiction. These three boys live an upsetting life, and this is true of children in Latin-American countries. We are forced to address this issue throughout and I read the book humbled and very keen to read more from Andy Mulligan. If you want a book that will stay with you and mean something to you, then I would highly recommend this. ISBN: 9780385619011, David Fickling Books, £10.99, Published: September 2010. On a final note…what a stunning cover. Three boys against the world. Yes, I’m reviewing another picture book but who can blame me when some of the most beautiful stories are told within these illustrative covers. Harry and Hopper broke my heart, but in a good way; a way in which my faith in humanity, love and devotion is restored. 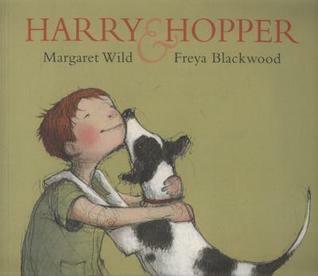 The story, written by Margaret Wild is all about a boy called Harry and a dog called Hopper who were each others best friend and lived their lives happily together. But one day Hopper dies and Harry is devastated and so lost. Without Hopper, Harry has lost his identity, and more importantly he has lost his friend and has been left behind. Understandably, Harry isn’t ready to let go and tragically starts to see Hopper everywhere he goes. As time goes by, so too do the memories of Hopper as Harry fears he will forget about him but through grieving and facing up to his loss, Harry learns to move on with his life, but without forgetting who his best friend once was. 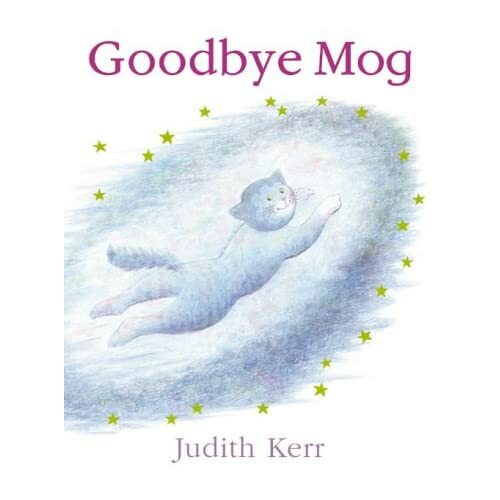 This is a heartbreaking and heartwarming story and resounds in the same way as Judith Kerr’s ‘Goodbye Mog’ and Susan Varley’s ‘Badger’s Parting Gifts’ did in talking about death and grievance. I would certainly recommend this as a book to use when trying to explain to a child that the grief they are feeling towards losing a loved one is absolutely fine. The illustrations perfectly depict how easy it is for Harry to imagine Hopper to be there in his bedroom with him, and how quickly he can go away. It’s a beautiful book to give to a child because there’s a true message that you shouldn’t be afraid, and you should enjoy your best moments with your best friend…as Harry and Hopper certainly did.